Project Purr’s feral cat program is coming up on 30 years and close to 4000 kitties spayed/neutered—for FREE! It was started almost three decades ago by Lynne Achterberg and Margaret Rinner, affectionately known as Saint Margaret. They have devoted countless hours to the care of feral cats and have been recognized nationally. They partnered with other like minded projects and organizatons. 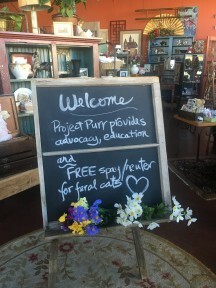 They rely on donations and goods donated by the community that they sell at Project Purr’s Rescued Treasures, their nearly three year old shop located in downtown Santa Cruz. 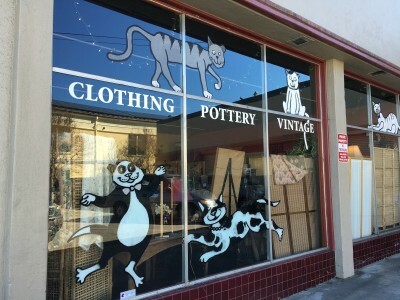 Project Purr’s Rescued Treasures Shop is located at 325 Front Street in downtown Santa Cruz and is open Wednesday through Sunday from 10-5. The shop relies on volunteers that help ship, sort, and sell items generously donated by the community. The proceeds go toward providing Santa Cruz County with the only free feral spay/neuter program, as well as FVRCP/rabies vaccines, and parasite control. They have been able to treat 3,880 feral cats for free since 2012. 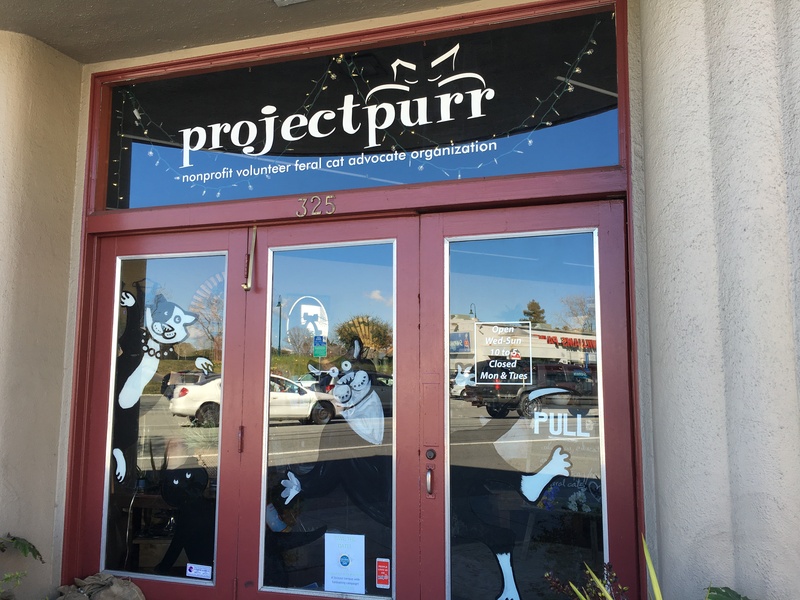 Project Purr works with the Santa Cruz County Animal Shelter which provides free traps (with deposit) and with two local veterinary clinics: Animal Hospital of Soquel and East Lake Animal Clinic. — Saves lives: Trap-Neuter-Return. Feral cats are responsible for over 80% of kittens. Half of them do not survive. — Humanely reduces the number of mouths to feed by fixing the cats. Spaying/neutering stops the breeding cycle and gives the cats a better chance at a long and healthy life. — Vaccinates all feral cats for rabies and FVRCP. Treats for parasites. — Collects and distributes salvaged pet food. — Offers the only drop in spay/neuter program for feral cats in the county for FREE! From their website: “For over 29 years, Project Purr has provided a spay/neuter veterinary package for feral cats/kittens to all residents of Santa Cruz County, regardless of income. Cats must be at least four months old or weigh at least four pounds. The package includes: spay/neuter, FVRCP and Rabies vaccines, parasite control, and mandatory ear tip (humane surgical removal of the left ear tip as a sign that the cat is fixed),” and it’s free for Santa Cruz County residents. If you want to donate, volunteer, or have a feral friend that needs treatment, please contact Project Purr. Check out more of Christina’s Santa Cruz area articles in our travel section and more pet articles in our Pets section. What a great story and a great organization. I care for a few ferals in our neighborhood. I have been taking care of ferals for the last 10 yrs. Someone has to do it because I can’t let them starve!! They have all been fixed through different Org’s.. My only thing I have trouble with is the food as you don’t have too much money on Social Security. I wish there was a place we could get help with this here in Az. I don’t think that a person needs to be a Saint to be a saint! Bless you and all that you do … and the kitties, too!